This manual describes a procedure for the study of the vegetative community of a forest. It includes a description of the main characteristics of vegetative canopies, species composition, and ratios of different plant species in the community based on their relative numbers, and for tree and shrub layers, the diameter of trunks, height and age. In nature, plants are distributed into layers. Each layer is a height group, depending on their demands for sunlight. Layers are easily visible in the forest since the plants share not only light, but also space for their crowns. The number of layers in the forest community can vary greatly. In communities that are rich in resources and species, there are more layers; for example, in tropical rainforests, there can be more than 20 layers. The forest structure of a moderate climatic zone is usually simpler, with not more than five layers. These forests are usually represented by three layers: the tree layer, made up of adult trees (ripe stand), the bush layer, meaning those that actually form the so-called "forest" bushes, which never grow high; and a layer of underwood, consisting of young trees, which grow to the first layer over the course of time. In addition to these three layers are two layers of soil surface cover; an herbaceous-shrub layer formed with herbaceous plants and shrubs, and a moss layer of terrestrial mosses and lichens. Not all layers are present at each forest type. For example, young spruce forests, where dense spruce crowns are pulled closely together, often consist only of two layers - forest and moss. There are also forests where the number of layers is higher; for example, stands consisting of several species of adult trees which greatly differ in height. The objective of this ecological field study is to have students describe the layered structures of a forest and to compare the structures of different plant communities. The completion of this task will help students learn the structure of the regional vegetation. Studying typical plant species with plant associations will help students learn the skills of botanical description, which are often necessary for research work on other subjects and natural objects. It is good to keep in mind that this procedure is greatly simplified and can be recommended only for educational purposes. For an elementary geobotanical description it is necessary to have the following: a report form (Table 1 at the end of this manual), a tape measure for dividing a site and for the measurement of the length of the fallen trunk (in meters), a centimeter ruler for the measurement of trunk diameters, and an altimeter (if one is available). A bag or herbarial folder for collection of unknown plants can also be useful. Paper envelopes are required for the collection of mosses. The work should start with the selection of a place for descriptions and laying down a test site. It is more convenient to begin this study with simple plant associations where the layered structure is well expressed and can be easily described, for example, a homogeneous coniferous forest. If such a site is not available, any other type of the forest with expressed layered structure and a small number of species can be chosen. 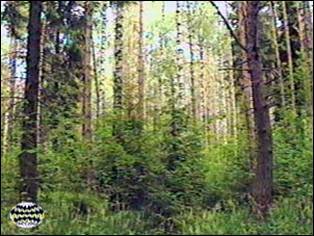 It is best if a homogeneous (average in every respect and section) forest is chosen for description.